This figure is a protomolded (or as has been called (albeit incorrectly) "internal first shot"). By its very nature a protomolded piece was an item made inside Kenner with aluminum molds created by their model shop and is a prototype of the truest form. One of the most distinctive methods of identifying a protomolded figure is that it is injection-molded in a soft white plastic which can be seen on the inside of the backpack. Since these molds were never intended for production they lack copyright dates as well as the foot holes. Since the construction of this figure wasn't done on production tooling, the torso was glued by hand. This hand assembly meant that there would be gaps between the torso halves as well as some limbs not fitting accurately, which is evident by the slightly protruding head. Interestingly enough this piece is completely handpainted in the paint scheme that eventually went to production (except here the tool on the shin isn't painted). Since the plastic itself is white even the base blue color is painted. The blue itself is about the shade that the L-slots were molded in. Previously thought to have existed only on later RocketFetts, it is now apparent that Kenner had the basic color scheme in mind for this figure since the beginning. 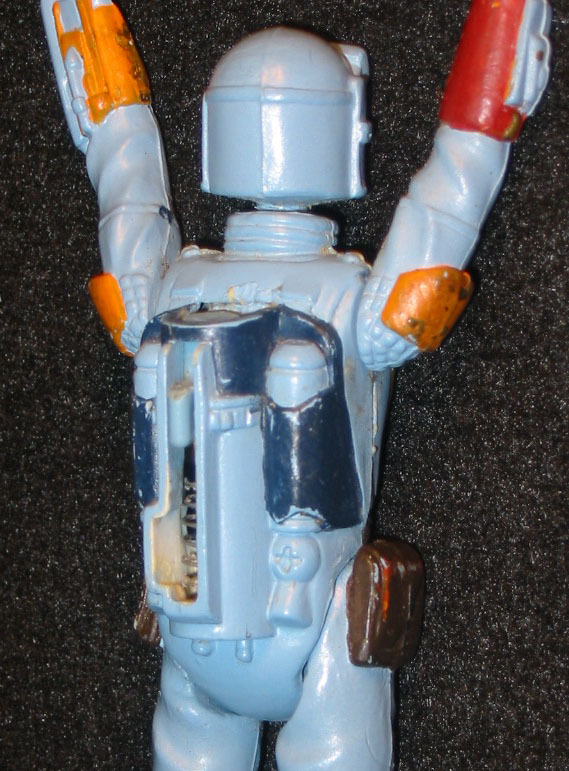 Other painted RocketFetts have turned up and one of the alternate color schemes sported a backpack which looked somewhat similar to the paint details of the 12" Boba Fett figure. Yet another RocketFett exists which is painted much like this one. As time goes on more and more examples of this fascinating figure have come to light affording us a better opportunity to understand the creation process of what is arguably the most famous toy prototype ever. The most obvious differences in this figure is the backpack itself. The slot on this figure is actually a "T" shape. This figure has now allowed us to see why Kenner shaped the backpack the way that they did. The latter RocketFett prototypes such as the L-slot and the J-slot were a refinement of this shape. Even though the very bottom extension of the slot was removed at latter stages the backpack shape wasn't altered. It's unclear why the slot needed to be extended down the backpack that far since the tab on the slider portion only needed to lock in its spot. Or maybe Kenner wanted kids to be able to "overload" the spring once in awhile for a shot that might go 1 inch farther than the pathetic 12 inches these things actually shoot. Keen eyes will notice the top of the backpack where the slot is "open". Upon comparison with an L-slot version it's quite apparent that this part of the figure was reshaped. It's possible that this open part of the slot was to more easily allow the finger to push down on the slider. The L-slot Fett tab was a tad larger so perhaps this was a solution to that problem. 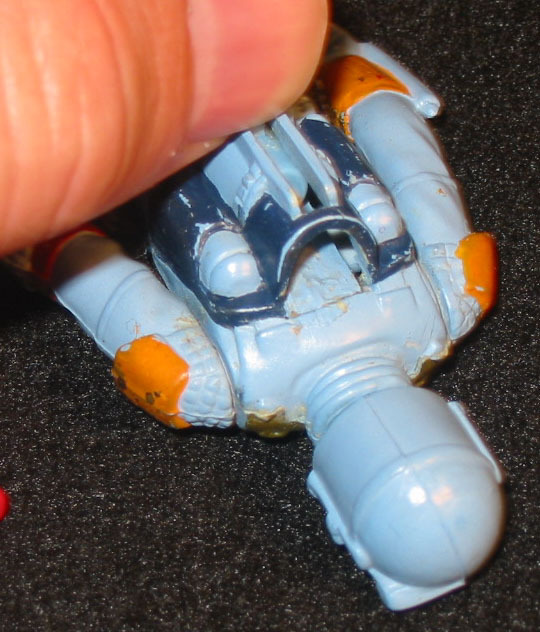 The internal cavity of the backpack on this particular figure has an added piece of plastic which helps guide the missile down into the opening and likely helped keep it in place. The later L-slot design would not require this extra piece, instead it would use a thin protrusion from the inside of the front torso half to help keep the missile in place. The spring is also unique to this figure. The later versions of the spring had less coils as well as being tapered so that the coils collapse into themselves. The slider on this figure is made of blue plastic instead of red which is more commonly found on the RocketFetts. 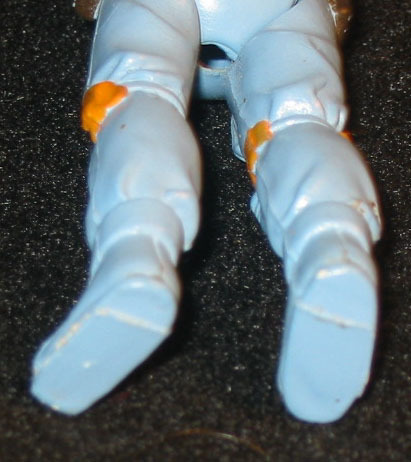 The blue slider has been known to collectors since its appearance on Kenner's 20 figure bin header created for the Star Wars line. Before now this was thought to only be an artist's rendition of the figure and it's a treat to see that the figure was initially made with this blue slider. This early version of the figure helps give us a glimpse into the design process used by Kenner. It helps show us why some elements of the sculpture existed and how the figure evolved into what we know today. It is through the tireless efforts of an anonymous supercollector that an item of this magnitude has come to light. Because of this collector's work, the Star Wars Collectors Archive has been privy to discovery of some of the most monumental Kenner pieces ever found by collectors. 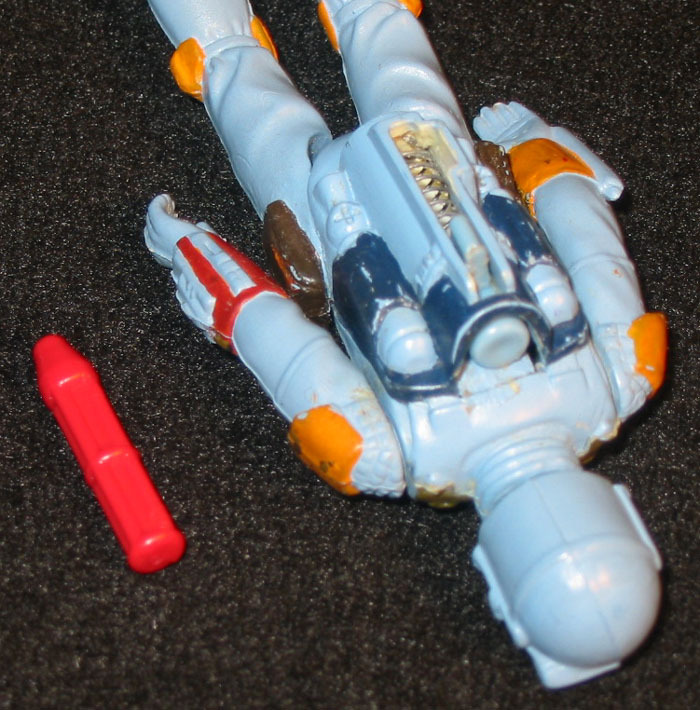 Contrary to popular belief, the rocket-firing feature was not removed from the figure because a child choked on and died from a Battlestar Galactica toy missile. You can read all about it here.